Welcome to the latest newsletter from Legge House, which features news for the past year, the coming year PLUS our good wishes for the coming festivities. It has been a tremendous Golden 50th Anniversary year, which we celebrated well. We have held several events to mark this wonderful milestone, including a Spring Fair, a Cream Tea and a Barbeque; at which we helped Edna Cripps celebrate her 102nd birthday with a cake and a hearty rendition of ‘Happy Birthday to You’! We also enjoyed a very special ‘Golden Anniversay Lunch’ in June when we welcomed several distinguished visitors, including The Lord Lieutenant of Wiltshire, The Mayor of Swindon, The Bishop of Swindon and our local MP Robert Buckland. At all of these events we have welcomed many of our friends and well-wishers – it was a joy to see you here, do come again. Further visitors during the year have included several members of the Legge family who joined us at he Barbeque. They are trying to find out more about Miss Legge, who contributed so generously to the opening of Legge House as a Conference and Activity Centre. We do know that she lived in Hinton Parva for a while. If anyone else has any further information, we’d be delighted to hear from you. 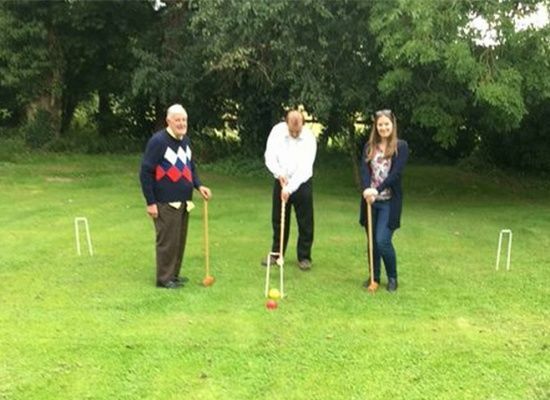 We received a lovely gift – a Championship Croquet Set – from one of the Friends of Legge House, who regularly prays for us – thank you very much. Anyone for a game one sunny day? I have played once or twice, is there anyone else out there? If you think it’s something you’d love to try, there are full instructions to help us get going and keep us on the straight and narrow. With some of the money raised during the year we have purchased a Dartboard and Championship Darts, Table Tennis Balls and, more prosaically, smart serviette dispensers! During 2016 the Centre was in use for 71 nights, with a total of 979 people enjoying residential stays. 2017 has seen an increase in visitor numbers, which is wonderful. The Centre was in use for 75 nights with 1117 residents. Lets hope that 2018 brings yet another increase! There have been 26 new groups, as well as returning groups, coming to stay at Legge House or to use it for a conference during the year. Any vacancies have occurred because multiple visit groups have been coming a litte less often. However, bookings are already coming in for 2018 and, out of the 32 groups booked in, 6 are new groups. Publicity is obviously working well, especially from Friends – good old fashioned word-of-mouth seems to be the most effective way of raising awareness of our existence. Please do continue to spread the word. When groups come to Legge House, especially those consisting of young people, they all want to go on the Internet at the same time. What happens? The system crashes! Hopefully, in November or December, we will have a brand new 4G wireless system installed. To aid us in this endeavour we have made application for funds to Wroughton Community Trust which has been received favourably! We will let you know further developments but, in the event that there is not enough funding available, we may have to come to Friends and well-wishers for additional help – as always, any donations are very much appreciated. A big ‘Thank you’ to all our Volunteers who help us out; some very regularly indeed. Without you Legge House would not be the same. We look forward to your continued contributions in 2018. We have said a sad and fond farewell to Beth Townsend who has been on the staff for many years and has moved on to pastures new in the village. Beth has been a huge help and will be greatly missed. Legge House, Church Hill, Wroughton, Swindon, SN4 9JS. For both options may we please have your name and address, even if you think we already have it, and, if you are a new Friend (Welcome! ), please tell us whether your donation is gift-aided or not. Wishing a very Merry Christmas and Happy New Year to everyone.